The white sands. The turquoise waters. The swaying palm trees. The curry-flavored eats. The soundtrack of soca and reggae that filled the air. And after a few tropical cocktails, the “don’t worry about a thing” you sang out loud, without a care. A likely description of your experiences and everlasting memories of your trips to the Caribbean. For many Americans, St. Maarten/St. Martin, U.S. Virgin Islands, Bahamas, Puerto Rico, and other islands have become a second home—the nearby destinations to go to when you desperately needed to escape the concrete jungle. Well, now that Hurricane Irma’s wrath has unleashed mass destruction as it continues along its path of inconceivable devastation, our beloved paradises desperately need us. Monster hurricanes and their long-lasting effects are not new to me. About this time of year, in 1989, when I was a girl, my mother quickly grabbed a few of our belongings, and whisked my brother and I to the airport to head to the U.S. mainland— we spent many months moving in with different friends and family members before heading to her home state of Colorado. We had just survived Hurricane Hugo. 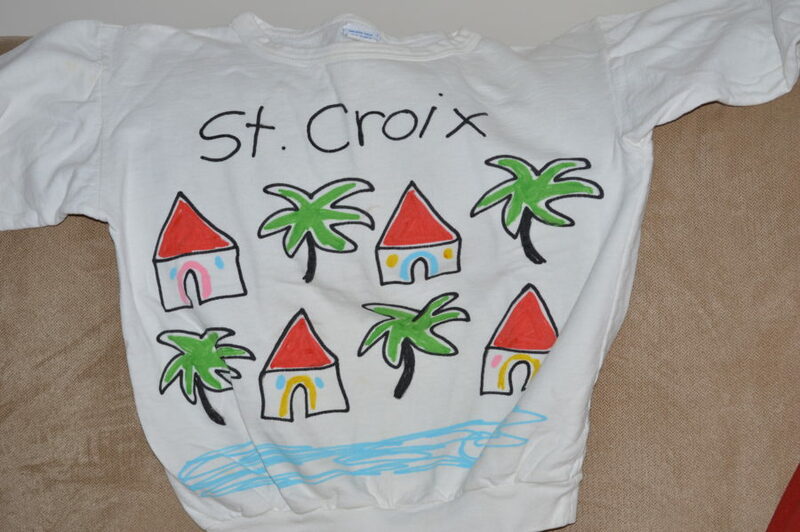 Although we thankfully made it through the storm, my home, St. Croix, was basically destroyed. There was no water, no food, no power. People were panicking. My mother had no choice. She decided we would flee. Dad stayed. Of course, we were one of the few lucky enough to get out. It was the months after the storm for the people of the U.S. Virgin Islands that were the real challenge. One of three special items I took with me when we left St. Croix. The visuals and stories from the aftermath of Hurricane Harvey provoked a feeling of anxiety and sadness I’d felt before. And then Irma. I couldn’t sleep Tuesday night, fearing for the lives of my family still living in the U.S. Virgin Islands. I couldn’t get any information other than a few television reports on St. Maarten. The images of destruction evoked a familiar feeling of physical pain and fear—the same one from 1989. My pain and fear stems from experiencing such an extraordinary storm, but it also comes from knowing exactly what the road (for those that are still intact) ahead looks like for Texans and West Indians. It could take months, maybe years. Harvey packed a powerful punch. Irma is doing the same, but to island nations who’s preparedness, evacuation, and recovery resources don’t even come close to what we have in the U.S. After Hurricane Hugo, it took months to get water and basic services back online and years for our islands and our people to “fully” recover. For the past several days, I, like millions of Americans, have prayed for the people of Texas and Louisiana. I’ve donated to causes that are helping them recover and rebuild. And I plan to do the same for Florida and other states that will be affected by Irma. And, of course, I will continue to pray, help locate the missing, and donate to recovery and rebuilding efforts in my beloved U.S. Virgin Islands and other Caribbean islands who are now beginning the long journey of picking up the pieces (literally) and getting back to life as they’ve known it. The Caribbean is my home. For millions of Americans, an island in the Caribbean has become a second home. So, yes, pray for the Caribbean, but also volunteer if you can; organize donation drives for much-needed items. Donate whatever money you have. I didn’t sit on the sidelines when my fellow Americans needed help after Harvey. And I won’t sit on the sidelines when my brothers and sisters in the Caribbean need me most. I hope you won’t either. This entry was posted in outreach and tagged #Caribbean, #Irma, #IrmaRelief. Bookmark the permalink.